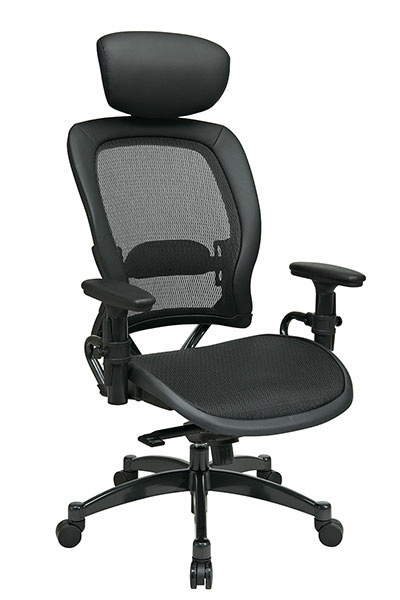 Professional Breathable Mesh Black Chair with Leather Trim, Adjustable Headrest and Gunmetal Finish Accents. Breathable Mesh Seat and Back with Adjustable Lumbar Support. Adjustable Headrest. One Touch Pneumatic Seat Height Adjustment. Infinite Locking 2-to-1 synchro Knee Tilt Control with Adjustable Tilt Tension. Height Adjustable Arms with PU Pads. Gunmetal Finish Aluminum Base with Oversized Dual Wheel Carpet Casters.